PUNE: The Maharashtra Metro Rail Corporation (MahaMetro) conducted a drone-based survey of the proposed Swargate-Katraj route to help prepare a detailed project report. About six flights of the drone, which had a camera attached to it, were carried out on the 6 km stretch. The entire exercise started in the morning and was over by the afternoon. The camera has captured the details along the existing Satara Road stretch from about 50-metre height. It has captured details like the width of the existing road, establishments along it, trees and buildings, among others. The survey was carried out by an agency appointed by the MahaMetro. Meanwhile, the MahaMetro has initiated steps to prepare the DPR of the proposed route. Earlier in a letter submitted by PMC to MahaMetro, the civic body had said the Metro line till Katraj would be crucial to further upgrade public transport infrastructure in the city. The expenses for DPR for Katraj route would be around Rs 60 lakh to Rs 70 lakh, which will be borne by PMC. 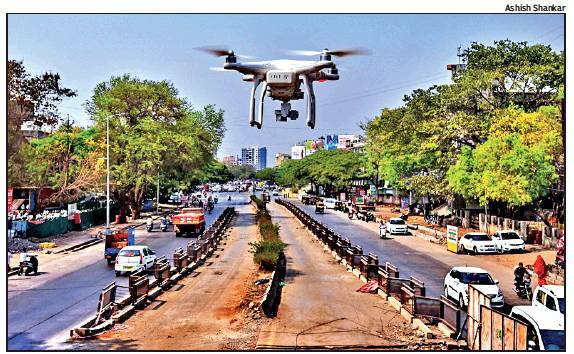 MahaMetro has so far completed drone survey of about 40 km proposed Metro rail stretches in Pune, Pimpri Chinchwad and the adjacent areas. Other routes where drone surveys were conducted include Nashik-Phata-Moshi-Chakan and Pimpri Chinchwad-Nigdi routes. The Union government has substantially hiked budgetary allocation for the Metro projects in Nagpur and Pune. While Rs 1,507 crore has been allocated for the Nagpur project, the Metro in Pune has received Rs 1,322 crore. This takes the total budgetary allocation for the two Metro projects to Rs 2,829 crore as compared to Rs1850 crore allocated during the FY 2017-18. The state government has also allocated Rs 310 crore for Nagpur Metro and Rs 130 crore for Pune Metro. The fund allocated for the FY 2017-18 was Rs 260 crore and Rs 110 crore, respectively. Thus, funds allocated for the FY 2018-19 is higher by Rs 70 crore as compared to FY 2017-18. Of the Rs 1,322 crore allocated by the Centre for the Metro project in Pune, equity is Rs 250 crore, subordinate debt towards central taxes is Rs 169 crore and PTA against overseas development assistance loan is Rs 903 crore. The MahaMetro on Saturday started the preliminary work of putting up barricades from Yashwantrao Chavan Chowk to Ayurveda Rasashala Chowk on Karve Road. The work will be extended up to SNDT Chowk in a phased manner. The effect of ongoing work will be tested on Monday when the traffic will be at its peak.